Alan Fletcher drew pictures as a kid. When it came time to choose a career, life in post-war Britain only offered him three options: go to university, join the army, or work for a bank. None of these was very appealing to him. However, he was fortunate to receive a scholarship to attend illustration courses at Hammersmith Art College. The next year—after he found out that there were other choices—he transferred to Central Art School. It was a livelier place, and as it happens, his future partner Colin Forbes was also taking classes there. Fletcher found himself part of a new generation of young designers whose evangelical mission was to design. Unlike the egotistical and sentimental 1940s commercial poster artists, this new breed was training to become a group of passionate problem solvers. When he graduated from London’s Royal College of Art, 1950s Britain was “a very grey, boring place. And America—from what I could see in the movies—was bright lights, Manhattan, Cary Grant and Audrey Hepburn.” Fletcher received a scholarship to Yale University’s School of Architecture and Design. 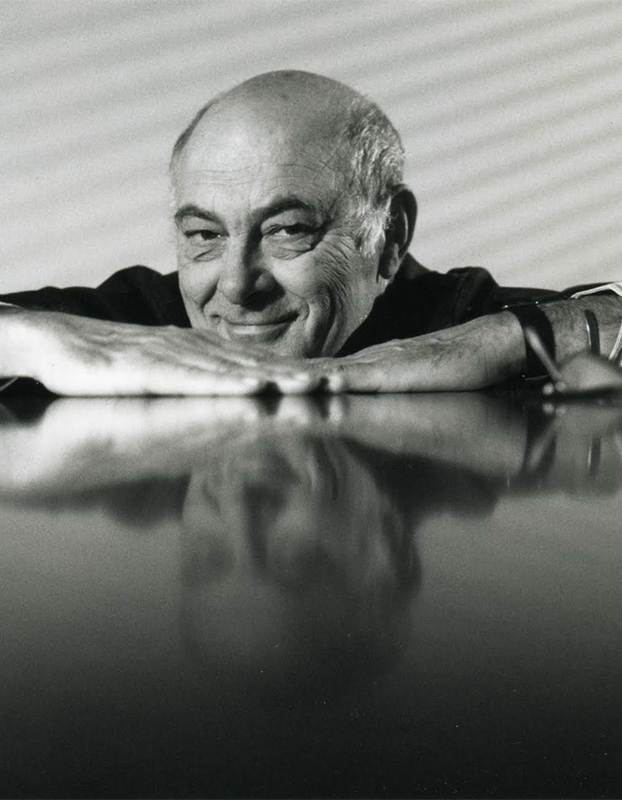 Paul Rand, one of his instructors, gave Fletcher a few IBM freelance jobs and Alvin Eisenman introduced him to other potential clients such as the Container Corporation. Then Fletcher took a trip to Los Angeles. Standing with his portfolio in a public phone booth, broke, he cold-called Saul Bass for an interview. Again, he just seemed to be at the right place at the right time. Bass liked his work and gave him some freelance work to do. But New York then was considered to be the world capital of graphic design, and Swiss Modern all the rage. So Fletcher returned to the East in 1958, landing his first salaried job at Fortune magazine. When he returned to London in 1959, most designers were still doing the same thing: one-color jobs in 8-point type. (If there was a second color it was always red or blue.) Fletcher’s portfolio filled with imaginative four-color jobs stood out. He had been back for only six months when Bob Gill rang him up. Aaron Burns had suggested that the two of them should meet when Gill moved to London. They went to supper and in 1962 they opened Fletcher/Forbes/Gill along with Colin Forbes. They didn’t get any work in their first month of business. Then some Penguin book jackets came in. They went to a cafe with a few design briefs and created them over coffee-sharing the project “like a bone.” Other clients followed—Pirelli, Cunard, Olivetti. Fletcher and Forbes formed a new partnership with Theo Crosby three years after Gill departed. They added two more partners, Mervyn Kurlansky and Kenneth Grange, which eventually resulted in the 1972 formation of Pentagram. Today Alan Fletcher works on his own. He retired from Pentagram in 1992 to devote more time to his personal projects, but ironically is busier than ever solving communication problems as the design consultant for Phaidon Press and Domus Magazine, and producing a corporate identity for The Institute of Directors. When Alan Fletcher received the honor of Senior Fellow of the Royal College of Art, he was toasted as a “design magician.” A partial reference to the fact that he found the name Pentagram in a book on witchcraft. Visual wit, paradox, and irony are ingredients contained in all of Fletcher’s work. He blends his Swiss-oriented, less-is-more, form-follows-function training with a very personal vision. To Fletcher, problem solving is not the problem, it’s “adding value, investing solutions with visual surprise and above all with wit.” He often misquotes a familiar axiom to define his design philosophy: One smile is worth a thousand pictures. He carries this theory to the extreme at times. He has been known to challenge the basic design brief supplied by a client, becoming a participant in conceptualization as well as the craftman of its realization. “I try to solve their problems, but in solving their problems take an opportunity to find that extra twist that adds the magic.” The art posters he did for IBM are a good example. IBM asked him to design a placard for their new Paris headquarters, which said a painting would shortly arrive for the space on the wall occupied by the placard. In response he did a series of posters interpreting the word “art” as defined by an author or artist, and put the line about the paintings in 6 point along the bottom. “If I had answered the brief, they would have got a straightforward placard,” he said. Fletcher’s client roster includes some of modern design’s most progressive patrons embodies a rich volume of material: calendars, magazines, brochures, books, identities, sign systems, desktop products and posters. In his work for these and other clients, it is obvious that he takes the business of humor very seriously. Each piece progressively carries progressively less inhibition about how images are made and demonstrates unfailing confidence in his own drawing ability. Fletcher has co-authored numerous books on design in which he displays many of these sentiments, including: Identity Kits-A Pictorial Survey of Visual Signs; Graphic Design: Visual Comparisons and A Sign Systems Manual. He has also co-authored four books of Pentagram work: Pentagram: The Work of Five Designers; Living by Design; Ideas on Design, and The Compendium. Fletcher’s working philosophy has earned him gold awards from the British Designers & Art Directors Association and the One Show. In 1977 he shared the D&AD Association President’s Award for outstanding contributions to design with Pentagram partner Colin Forbes. In 1982 the Society of Industrial Artists and Designers awarded him the Annual Medal for outstanding achievement in design. He served as President of the D&AD in 1973 and as President of Alliance Graphique Internationale from 1982 to 1985. He is a Royal Designer for Industry, a Fellow of the Chartered Society of Designers, and a Senior Fellow of the Royal College of Art. In 1993 he was awarded The Prince Phillip Prize for the Designer of the Year.